Ashland, Oregon, May 9, 2007. Probably at 7 p.m. The presentation will include a slide presentation and a Q & A discussion. 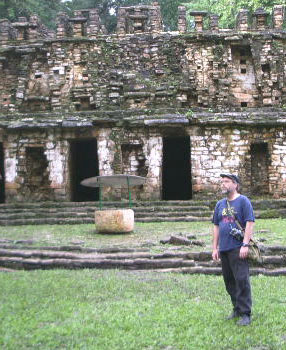 John Major Jenkins is an independent researcher on the cutting edge of Mayan Studies. Making several pioneering contributions since his first book was published in 1989, Johns work is distinguished by good scholarship as well as progressive spiritual insights. His deep respect for authentic Maya calendar traditions was inspired by living and working among the Highland Maya on his many trips. The unresolved questions of forgotten aspects of Mayan tradition, notably the meaning of the 2012 date, became a focus of his work and culminated in 1998 with his internationally recognized book Maya Cosmogenesis 2012. The discoveries pioneered in that book were then expanded in Galactic Alignment (2002). Much sought after for documentary appearances, John has been featured on Discovery and History Channel programs and in the recent film 2012: The Odyssey. John has taught at Esalen Institute, Naropa University, the Institute of Maya Studies, and various think-tank conferences including all three of the Conferences on Precession and Ancient Knowledge sponsored by the Binary Research Institute. His articles have consistently found an appreciative and receptive home in the pages of the Australian-based magazine New Dawn. A recent field trip to Izapa confirmed his thesis that a profound galactic cosmology was formulated there. Johns work is unique because he deciphers and explains the 2012 teachings at Izapa, the early Maya site that invented the 2012 calendar. In September 2007, Sounds True Publishing will release his 3-CD audio program called Unlocking the Secrets of 2012: Wisdom from the Ancient Skywatchers. John continues to teach and regularly gives presentations and workshops, his major focus being how the carved monuments of Izapa encode perennial wisdom, manifesting as a galactic cosmology, a Creation Myth, a prophecy, and a spiritual teaching for 2012.